BEIRUT (CNS) — While procedures are being put in place for Syrians to return to their war-torn country from neighboring Lebanon, the refugee crisis continues to linger and remains largely unchanged, a Caritas Lebanon official said. In recent months, several hundred Syrians have left Lebanon in organized returns to their homeland, coordinated between authorities in Beirut and Damascus, the Syrian capital. 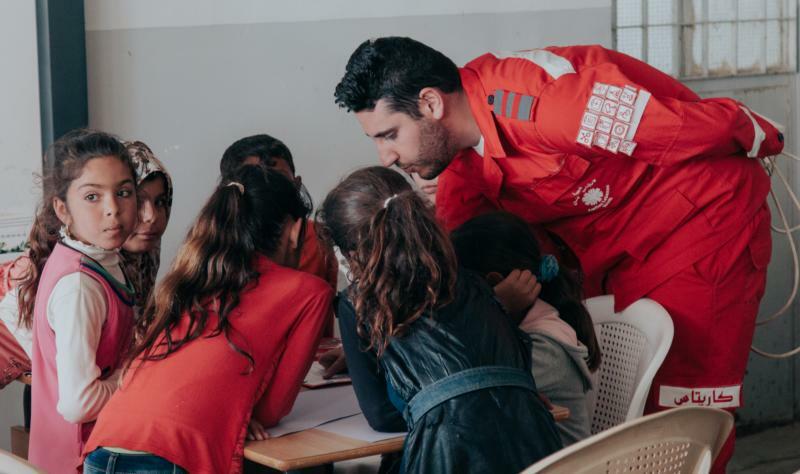 In early August, Lebanon’s General Security Directorate announced that it had opened 17 centers across the country that would receive applications for Syrians who want to travel home. Yet the reality regarding the refugee situation in Lebanon “is still almost the same,” Father Paul Karam, president of Caritas Lebanon, told Catholic News Service. The Catholic aid agency has been involved in the humanitarian crisis for more than seven years. “We are not seeing huge changes yet,” Father Karam said. In Syria, Amina said, the family’s life on the outskirts of Damascus “was comfortable” before the war. Her father owned a food processing business, rental properties and a restaurant. But Amina says all was destroyed in the war, along with their home. Currently, Amina is enrolled in a Caritas Lebanon computer class. After a recent session at the Caritas center, Amina noted that she previously didn’t know at all how to use a computer. “Now I feel more self-confident. I can search for a job, because I am more qualified with computer skills,” she said. Amina said her family would consider returning to Syria if they are able to make a new life there. Still, education is her biggest priority, whether in Lebanon or in Syria. “I want to finish all my studies,” she told CNS. Nisrene, 30, a mother of four children ranging from 2 to 8 years old, is one of Amina’s classmates in the computer course. Her family fled to Lebanon six years ago from Idlib, a current flashpoint town in northern Syria. If it was safe to return Idlib, Nisrene would prefer to go back to Syria. “I’m not happy about our living situation here,” she said. Father Karam, the Caritas official, said it is important for the international community to respond to the continuing refugee crisis, “but also to respond after the crisis and especially to deal with the consequences of the crisis.” He said economic assistance and employment are needed along with development projects. PREVIOUS: Is there truth in Archbishop Vigano’s text and how are Catholics to know?